The Kingdom of Mercia, run by felines it is a prospering Kingdom. Except when a coup is orchestrated by a Jaguar and... The King dies. 873 readers have visited this universe since BlueWind_22 created it. A thriving Kingdom where Feline Humanoids are the main type of species though you will run into other species present, such as the foreign Wolf, Bear or Fox. There are more species than that, but of course, in Mercia, the main population consist of mostly Felines so I won't get into that just yet. 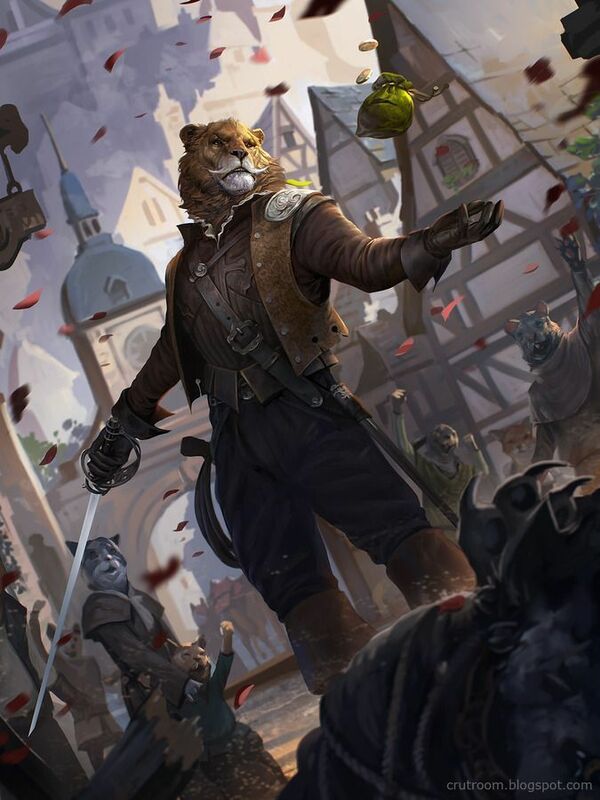 The Kingdom of Mercia has many Felines species and they are most often referred to as Breeds, or in some situations, Clans. In these Breeds/Clans, come types as well and it can be confusing for a foreigner. Anyways there are Lions, Leopards, Jaguars, Tigers, Servals, Cheetahs, Pumas and the most common, Cats. Those are just the most commonly known Breeds, but are more lesser known Breeds as the Fossa who are mostly Pirates, and Bobcats who hide away in their mountain towns. As there are quite a variety of Felines Species, most have more than one sub-species and so are categorized into one of the four seasons to depict the environment from which the came. For example, Tigers from the coldest most Northern part of the Kingdom are called Winter Tigers - the equivalent of Siberian Tigers IRL - while Bengal Tigers are referred to as Summer Tigers. Sizes are as varied as there as Breeds. The smallest of the Leopards, cats and Servals range from 4 to 5 feet high. While the most common such as Cats, Pumas, and Leopards tend to be 5 to 6 feet tall but the largest of all the felines are the Winter Tigers, growing anywhere from 7 to 8 feet tall with summer tigers and lions vying for second place. What has happened: The Kingdom of Mercia was peaceful until the king died, apparently killed by his own son, Korso. The palace is in anarchy as the well know Jaguar Lord comes into power and claims that it was the two oldest Princes who have made a play for the throne. In the end, he kills the supposed betrayer, Prince Korso. Unknown to the people, it was actually the Jaguar lord who killed the King, and afterwards, killed Prince Korso in order to take the Throne. The Queen, knowing the truth has taken her youngest Cub, Prince Soren and escaped. Meanwhile, Prince Everett is still in shock and separated from his family, runs into a Tradesman. How lucky was he. The Royal Family are Winter Tigers, as has their family been from the start of the Kingdom. They are beloved by the people, but recently, the King has been ill for awhile and not to mention, the string of bad rumors about the two oldest Princes. What is going on? 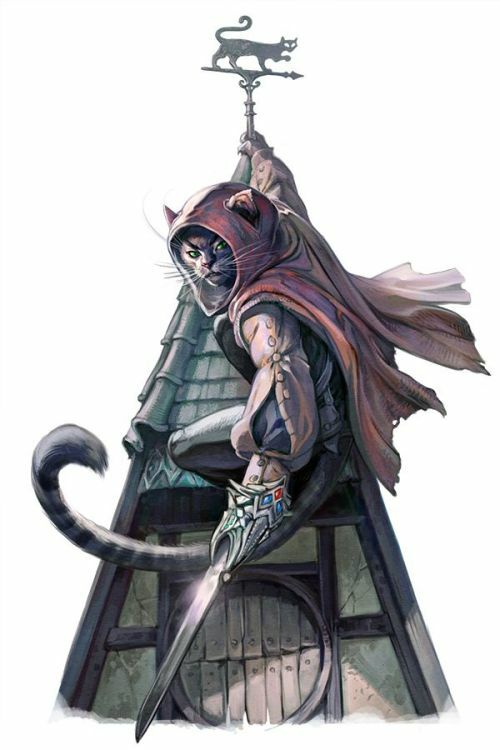 Throughout the land lies a network of handy felines that will do anything from making your house, delivering a message to assassinating your rival. And maybe even kill those pesky shadow monsters that have begun appearing every now and then. All for a bargain that is. Their business has no name but the felines who work under this mysterious network have many names. Yet the most recognizable name for them is Tradesman and whatever they are best at is often called their Art. And since their business is all about variety, the missions are grouped into rank types and matched to tradesman with an Art that best fits the mission. Keep all OOC arguements in the OOC forum CIVIL. No killing other characters without their Creator's consent. No one liners - But please try to write quality things. No disappearing - I get it, real life stuff happens, but please notify me if you are gonna be away for awhile or extremely busy. And while we will be PG-13 for the most part, there will most likely be some Mature themes as well. Don't bother joining unless you will still be with us 90+ days into the RP. Kosovo eyed the the Prince coolly, though not with contempt. "My liege, I am first a subject, and then a tradesman. I assure you that my loyalty is unquestioned," the leopard responded, recognizing the need to make that concession. Turning his stance slightly to open himself up to the others, he raised a paw in gesture of the streets that ran outside the alleyway. "Speed is of the essence. There is a streetcar that runs down the middle of the main all the way to Central Station. Naturally, there have been checkpoints set up, but as long as we get off the block before, we should be fine." Without so much as a pause for clarification, Kosovo turned to pick his way down the alley. Nellie took the chance to return Jana's remark, taking up position behind the Prince to act as a rear guard. "Employer, more like. He's the first cat you'd look for to get yourself out of a sticky spot," Nellie explained, a hint of admiration in her voice. She turned as if to start walking, before halting, as if she had thought of something. Turning back, she asked "Are you goin' to come along? I'm sures we can get His Highness out just fine." She expected the answer to be a polite "no", from which Nellie could transition into a brief note of thanks. After all, who would want to throw themselves into more danger? At the end of the alleyway, Kosovo stepped into the light of the street, acting as natural as any cat would in the midst of a riot. Jana would never know why she said yes. Every ounce of her intelligence had screamed at her to say "no" to Nellie's offer. Besides, what incentive did she had? She'd be risking her life for some snobbish royal who only cared for himself. And yet, she complied. Perhaps something from her past days in her tribe had remained, some sense of loyalty to the pack. Or maybe she did have a shred of mercy within her. Regardless, her reply was, "Of course I'm coming along. Regardless of whether you or Everett think so, you need my skills." And so, stunned at her answer, she followed Kosovo out into the street, trying not to flinch from those who gave her hard stares. More than a little surprised that Jana wanted to continue to help, Nellie's breath caught as she tried to say something to follow up. 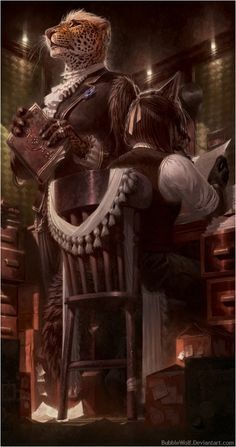 Part of her was defensive that the shewolf had thought that Nellie held her abilities in contempt, but the reality was that, well, she kind of did. What did the wolf know about sensitive scenarios like this? And having a canine along wasn't exactly a good way to avoid prolonged gazes of passers by. Whereas Nellie could hide her rather conspicuous way of speaking by merely not doing so, it was something else to hide a wolf's tail. And ears. Clamping down on those thoughts before they snowballed away, she made her way towards the alley's exit, stopping before she passed the Prince. "C'mon then, your Highness. Our tourn to be save'n you, yeah?" Nellie said with the lightest laugh she could force. If Kosovo was surprised at Jana joining him in the streets, he didn't show it. Instead, he merely pointed to the electrified wires that were strung down the center of the avenue. Being on the shorter side of the general population, he relied on the movement of the lines to know the trolley was coming. "Next streetcar will be here in two moments. Jump on the back and stay near the doors, we won't be on for long." Prince Everett was for once, glad he had been saved by these fellow felines. He had no response for Mr. Kosovo other then to nod his head, and after pulling the blanket Jana had thrown on him to cover more of his face, he followed the spotted leopard. He kicked his lips and teeth in a strange way, suggesting hunger and stress. 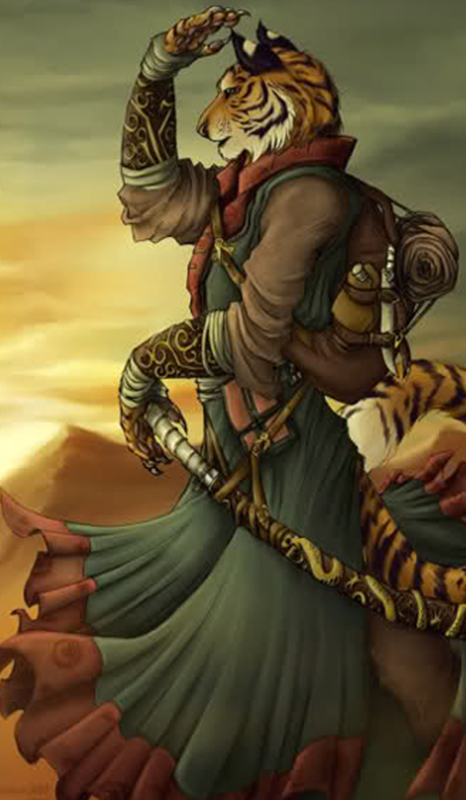 Though other then that, he just pretended to be a tiger with a hunched back, limping about his own business. Just hoped no strange felines would call out about the smell of blood that emanated from the injured tiger. He was just starting to wonder what the females in their group were conspiring about when they suddenly broke up whatever conversation they were having. Jana passed him quickly and was followed by the Cheetah, who stopped to speak to him. "C'mon then, your Highness. Our tourn to be save'n you, yeah?" "You're a bad actress," his statement did not suggest it to be a bad thing but - "But thanks for not leaving me back there." With that, he continued his hobbling to keep up with Mr. Kosovo. "Next streetcar will be here in two moments. Jump on the back and stay near the doors, we won't be on for long." Everett prepared himself mentally for the pain the jump would incur. As the streetcar approached, Jana hid in the shadow of a wall. As soon as it began to pass, she nimbly dived and rolled onto the back in one single, fluid motion. She landed softly, and making sure nobody noticed her, pressed up against the wall by the door. She then motioned for the others to follow suit. Soon after Jana, but not close enough that it would appear the two were affiliated to the casual viewer, Kosovo made less graceful jump onto the moving vehicle. Seemingly unsteady for a moment, the ocelot maintained his paws and soon fell into the press of bodies within the crowded car. He did error in getting too close to the middle where he couldn't see the window, so he added counting the stops to his list of worries. Nellie, alternating between fluster and flattery at the Prince's comment, had fallen a bit behind while minding her charge. The trolley was starting to get up to speed, and the cheetah had to gird up her dress in one paw so that she could manage the speed needed to catch it. She was pulled on by a smiling stranger, who tried to make a humorous remark about her almost missing the timetable, but Nellie wasn't listening. She was concentrating on seeing where the other's had gotten to. The last to jump onto the trolley, Everett steeled himself for what happen, as he landed. The world was red with pain, and it didn't help that the trolley jerked forward a little, sending him careening into the stranger in front of him. His shoulder! It was a miracle that he didn't let out a yowl. The press of the crowded streetcar waxed and waned as it made it's way down the stops, but it never totally thinned enough to grab a seat, even if everybeast were to act the perfect gentlemen to her. At least there was always a leather loop from the ceiling to cling to. No matter, thought Nellie, they would be getting off soon. She was not overly apprehensive about being caught while riding the trolley, she recalled a story that Mr. Kosovo had told her. Apparently, there was a small ritual among Trademan Initiates that involved getting from one side of the town to the other without being caught by the instructors that patrolled the middle. While many creative ways of completing this challenge were tried, from jumping rooftops, to crawling sewers, the masquerading every thinkable profession, the challenge was very rarely successful for the Initiates. That was, until a young cat in Kosovo's class merely jumped on the bus and rode it to the other end of town. No one had thought to look in such an obvious spot. Kosovo, far from dreamily recalling that particular memory, had managed to squirm his between passengers to a window. Looking through the dirty glass, he could see from the street signs that now was the time to jump off. At the next station, he alerted his compatriots with a jerk of the head, and got off the car. A block more to the station, and they would be out of this capitol and able to regroup. Silent as the wind, Jana tucked and rolled off the streetcar and into the street, unseen. Then, sticking close to the shadows, the she-wolf followed her allies as they headed towards the train station. As they moved, she kept an eye out for any guards noticing them, or just suspicious activity in general. These future moments would forever be etched into his mind. The jerking of the trolley, and the squishing and squashing of those all shoved inside it. Strangers were unknowingly hurting him, their new crown prince meant for the throne. Somehow, he found that funny. This was then followed a silent hiss once the trolley jerked to a final stop. Looking out through the window panes and the in between passing strangers, he saw the small spotted leopard. Kosovo. Everett hunched in on himself and maneuvered he way off the trolley. Once off, he started limping after Kosovo, not noticing that all the constant movements had kept his shoulder wound from healing. The blood was already beginning to seep into the blanket tarp like thing Jana had covered him with. Kosovo had long mastered the act of playing the casual civilian. Nellie was envious of his projected coolness, as she sought to do the same. Not a moment passed that she did not want to look backwards over her shoulder, or to speed up and get out of the public view. The young cheetah had to force herself to slow down, walk measured steps, and wear a mask of ease. It wasn't likely that she would be recognized, of course. The only beasts who had seen her helping His Highness the Prince were those sentries on the bridge, and the odds that they would encounter them again were remote. So she brushed down her skirt, adjusted her hat, and pushed on with a forced jauntiness. As with other times of turmoil in the city, beasts of all classes that could afford to do so were making their way for the train station. It didn't matter whether it was the threat of plague or the threat of invasion, the collective reasoning was that the countryside was safer than remaining in the capitol. When it came to passing the checkpoint set up in front of the terminus, Kosovo and company would easily be able to squeeze through in the press. Luckily, they still had their two return tickets for the 4:10; it would be impossible to purchase new ones with the station in such a tumult. In the crowd of the platform, Kosovo took the small risk of addressing his companions openly once they caught up. "Alright, your Highness. Take this ticket, it will get you to Draxton. Nellie will accompany you," Kosovo explained as he handed over his pass, using his other paw to stifle Nellie's inevitable objection. "Nellie, take the Prince to my home. Stay with Alice until I come." He turned at last to Jana. "Thank you for your help, miss. I'm sure you will be able to return through the checkpoint without any trouble," the leopard said, giving a small tip of his cap. Use your INK to craft new artifacts in Jaguars and Thieves - Part 1. Once created, Items cannot be changed, but they can be bought and sold in the marketplace. Yeah, throw her hat in the ring and we'll see how it goes. Ok at least you are listening. A foreigner wolf sounds good, I was thinking of someone good at sneaking. Not exactly a ninja, per se, but probably a valuable asset for the good guys. I also thought it would be interesting to play a character in a world where most would be prejudiced against that character. I'm curious about how the good guys will react to her. Because they are going to be an important character in Part 2 of this RP series. And maybe part 3 if we get that far. Also I did say that I didn't expect anyone other than myself and William Krypt to join. What? That's stupid. Why bother making a character if they're barely gonna be seen at all? What's the point? Also I don't really like the RPs where you ONLY can play those certain characters laid out, and where you can't just make your own. If that's the case for this one, I'm not gonna play, because what's the point of playing a PC who barely even gets any screentime? Wow, I wasn't expecting anyone, other than myself and Krypt to join... But don't be put off by it. You did read the rules? We are hoping to go the distance. And about the good wolf thing, we do have a good wolf role - I just forgot to put it in the roles section. Although I do have to tell you it isn't gonna be seen/played until the end, and we are still debating about some "Top Secret" info about that certain role. Hey, I've got a question. Can I play as a wolf character who isn't a bad guy? I think that would be more interesting to play than some knight in shining armor (or something similar). This is the auto-generated OOC topic for the roleplay "Jaguars and Thieves - Part 1"